Back to Southwest Florida Index Page. Our first stop from Burnt Store Marina was Useppa Island , a private island retreat available only to members. The owners of Southwest Yacht Charters are members and therefore charterers through their company get the benefit of a stopover, and beneficial it is. We think this was a highlight of the trip. Useppa is just a short hop from Burnt Store Marina which would give us a chance to get to know our vessel before the longer legs on the “outside.” The Useppa entry channel into the harbor from the Intracoastal waterway is nine feet deep at low tide and the marina can accommodate craft up to 120 feet in length (when the ferries aren’t in residence). The harbormaster monitors channel 16 and handles all slip assignments, but don’t expect an immediate response if there are multiple boats coming in. The channel begins at ICW marker 64. We found it fascinating to see road signs in the ICW, akin to small billboards telling you what you’d find at end of the channel. You really can’t go too wrong. When you see the sign that says “ Useppa Island ”, you turn in. Stay in the channel. Friends of ours followed written instructions to turn in at the wrong marker and promptly ran aground. TowBoatUS was so helpful and got them off on a dropping tide in time for dinner! There are two restaurants and bars available to the visiting yachtsman. The Tarpon Bar right on the waterfront is a casual establishment. The more formal Collier Inn provides an experience you won’t soon forget. We had lunch outside on the terrace, with fresh seafood and very nice service overlooking the beach and several colorful boats bobbing on moorings off the beach. What a way to get going! The highlight of things to do on Useppa include walking the Pink Promenade the length of the Island . It was originally constructed in 1903 of shell and pink sand and it is quite magical. 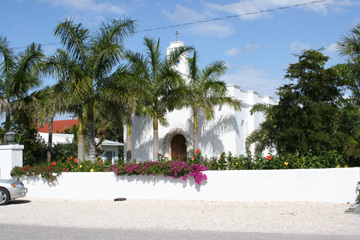 You walk past the homes, the beaches, the tennis courts, the pool, the museum, the Inn and everything else on the island. You’ll see a turtle “rushing” down the promenade and he will not change lanes or slow down to make room for you. You’ll see amazing banyan trees that drop roots from their tops to stay put in hurricanes, garden full of orchids and staghorn ferns, night blooming cereus, and lush tropical vegetation. What’s amazing is that this place was virtually wiped out by Hurricane Charlie several years ago, and all but the tennis courts have been magnificently restored. Another really interesting thing to do on Useppa is to visit the museum. For a tiny island, it surely has a lot of history. The museum has an excellent self-guided tour, with tape recorders that recount the story behind all the exhibits. The story begins with the Paleo peoples around 8000-6500 BC who used this place as a kitchen midden, building up the elevation with their discarded shells, and leads to the recent history of tarpon fishing, celebrity visits, and staging for the Bay of Pigs offensive. Aside from these activities, the best things to do are to lounge in hammocks strung between palm trees on the beach, swim in the heated pool, play tennis, or arrange for a round of tournament croquet (whites required). Dinner at the Collier Inn is a treat, and the staff are really special. Coat and tie are de rigueur at the Inn . Peruse the photos of the fishing era while you toast the sunset at the bar. Our next stop was Naples , a long 45 mile crossing of the Gulf of Mexico . The wind was blowing a steady 15+ knots and was expected to gust to 20 before dropping down to 10. We were all set to leave early that morning. As the fleet started to cast off, we prepared ourselves to do the same. Fearing being blown into the pilings we kept the upwind lines secured until last then cast off and gunned the engine. Nothing happened. Try again, I said. Nothing happened. Was something wrong with the prop? Nope we were solidly aground in the mud. As it turned out, it was a full moon and the tides were exaggerated being almost an extra foot lower than MLW! As the boat with the least draft in the fleet (3.5 feet), we hardly expected this. But sure enough, we were aground and the tide had about an hour to go before it turned. If we couldn’t make it out, we would not make Naples . The boat to port of us made it out. The one to starboard was even more stuck than we with a draft of 5 feet and a wing keel that tends to stick to the bottom like a suction cup. We threw some lines to our friends ashore, and heeled the boat over on its side. They dragged it sideways into the next slip where there was obviously a bit more water, and she popped out like a cork this time. Yahoo, we were on our way! The first half was great, we had 20 knots of wind, that kept dying until we stopped making headway. At that point, the iron genny made its debut. We had to keep an eye out for nets set by the shrimpers off the coast, but our passage was otherwise delightful. One of our fellow charters owns a home about a mile out of town and directly on a series of canals that have great anchoring possibilities. 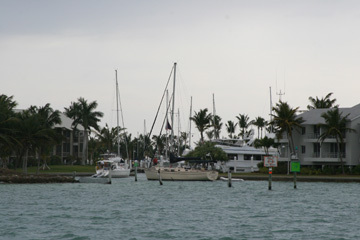 Our entire fleet anchored inside Gordon Pass and dinghied to the private docks of this beautiful community. Naples is an upscale city reminiscent of Santa Barbara , but with somewhat less history and character. There are plenty of shops and restaurants, wonderful art galleries (including a spectacular little gallery with numerous works of Salvatore Dali). And of course, there is golf. In fact there are 35 golf courses in the vicinity of Naples . There are a number of fine restaurants in town, as well as a few serving casual fare. Dinner at the famous Campiellos was top notch. Dinner the next night at the Real McCaw provided a counterpoint of Old Florida style and fare. All in all, Naples is certainly a great stopover with diversions for all. Don’t like shopping, then head for the beach. Right in town, at the edge of a park, with a beautiful extensive fishing pier dividing the beach into two picturesque halves, this beach area provides plenty of ambiance, a place to gather, and a recreational focus. The town pier is the center of ocean front activity in Naples . The long pier serves fisherman and promenaders alike, and the fishing remains bring in droves of pelicans looking for a handout, which gives the interested tourist a chance to see these prehistoric looking creatures up close and personal. There are facilities and a snack bar along the pier, and the beaches are right in the middle of town making it easy to access the amenities of the town. 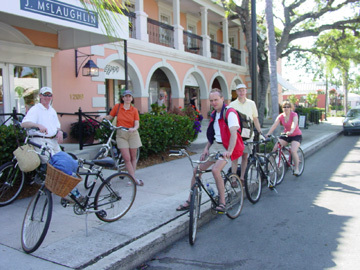 Rent a bike and ride over, then ride into town for lunch. Someone’s gotta do it! After our visit to Naples , we started our return leg, working shorter hops on the way back. Our first stop was St. James City at the tip of Pine Island . After the posh presentation of Naples , St. James City was like a déjà vu that hasn’t happened yet. We sailed all the way across the Okeechobee Waterway and then to the “Miserable Mile” where the depths are daunting, across to San Carlos Bay to anchor off the “city” in the marked anchorage area. The Sanibel Causeway Bridge opens every 30 minutes and the bridge tender monitors VHF channel 9, and not the usual channel 13. There is little water inside the canals but one place to visit for sure is the Waterfront Restaurant. They are open for lunch and dinner and some of the friendliest folks you will meet. We stopped for a seafood feast of fresh oysters from Louisiana that day. Ummm, Ummm, Ummm. Served with homemade sides and sauces, as well as a new beer launched by Jimmy Buffet and available only in Florida called Land Shark and made under the Margaritaville label. It looked an awful lot like Corona , tasted better than Bud, and had a funny label as would be expected. We took a dinghy ride down the canals to explore and saw a lot of for sale signs on properties that looked like the landside homes of cruisers just returned home. These were mixed with gorgeous spreads of lavish estates. Looks like old Florida is going, going gone, upscale. The village is about a mile from the restaurant and there is limited provisioning available. We asked for ice at the restaurant and they were kind enough to sell us a large bucket full for a couple of bucks. We brought the bucket back at dinner time. A lot of the entrees we were hoping to chomp into were already sold out. So if you have a taste for something special, don’t wait. Our next stop was Captiva, and the beautifully rebuilt South Seas Resort and Marina. If it feels like its brand new, that’s because it is. A couple of years ago, this resort was wiped off the map by Hurricane Charlie. A multimillion dollar rebuild later, everything is sparkly and new. 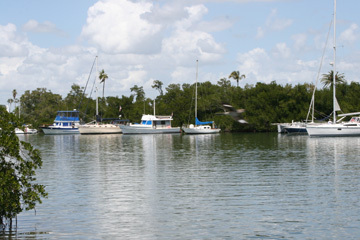 The showers are quite adequate, there are several restaurants, a beautiful golf course just off the beach, a lovely pool with a snack bar and terrace overlooking the ocean, brand new docks in a superbly protected deep water marina complete with a family of manatees to keep the children occupied. About the only thing that was distasteful is the fact that you cannot do anything in this pace without your guest registration card. You can hardly get a glass of water without it. And, to sit by the pool, you have to have a wrist band identifying you as a paying guest. Perhaps I did not understand, but it seems to me that if they need a trolley bus to take people around the resort because it is so vast, it is hardly likely that throngs of unwelcome interlopers would be sneaking in to the pool. It made it feel unnecessarily exclusive and almost paranoid about trespassers. Maybe it’s just me. Anyway, the staff were professional, courteous, and most helpful. The dock hands were among the best we’ve ever encountered, and our stay was brief but enjoyable. Dinner was at the amazing Yacht Club a ways down the road. What a spot they have! Waterfront on two sides! We pulled in by car on the ocean drive side and walked in to a warm reception and view across to the harbor on the other side. Sitting in the dining room, you could have a great view of the sun rise and sunset without leave your seat. Once again, we walked the beach searching for the elusive shells we’d heard so much about. In stead we found colonies of birds perched on the beach, each species in its own separate grouping, and each grouping facing a slightly different direction all together. At first we thought perhaps they were facing into the wind which was swirling along the beach. But that did not explain it. Then we thought they might each have a preference for a specific angle to the sun. But that wasn’t it either. Finally, we decided that they were prepared for a concert or lecture as they were facing toward one point on the beach. Alex decided they were awaiting the coming of their supreme commander who would shortly descend from the heavens for a command performance. It was the most plausible explanation we could muster. The manatees were also quite entertaining, several young ones frolicking in the marina to the joy of the onlookers. It’s not so common to see them up so close and so active. In the past, I’ve seen lone manatees, huge and lumbering rolling along the canals, but to see four young ones diving and sowing their rounded flukes was quite fun. On we went to our next and final stop in the company of a whole family of dophins swimming along in our wake. The next day, we decided to make a stop at the restaurant in Cabbage Key for lunch. 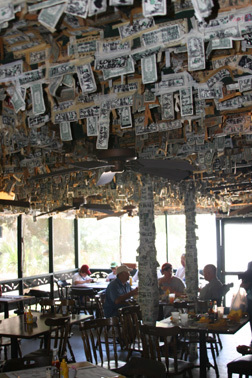 Every square inch of it’s legendary bar is covered with $1 bills that have notes from people who have passed by. However, the place is inundated by hordes of tourists from the mainland taking a day trip out to the islands by ferry. Group after group flock to the restaurant for lunch, hike the island, then head back home loaded with T-shirts and other reminders of the unusual island. This place is reputed to be the inspiration for Jimmy Buffet when he wrote about the cheeseburger in paradise. We had to see it. It was originally developed by ___ whose son owned the island. Just as our fleet arrived so did two ferries from the mainland which disgorged hungry hordes at the foot of the island where a small souvenir shop greeted them. Every one of the tourists ran up to the restaurant and placed their names on the waiting list. The place was packed. The beers were chilled. The hamburgers were mediocre, and the crab claws were overrated and overpriced. It turned out to be one of the most expensive meals we would have all week. There are hiking trails on the island that are open to the public but we did not take the time to explore. 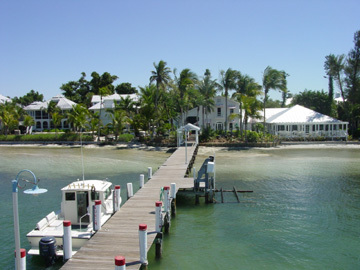 Back in time to the wonderful world of Boca Grande what a grand dame she is. 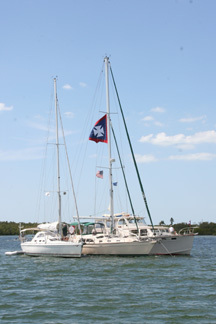 Boca Grande, which we passed by on our way out of Burnt Store Marina, is on the Grand Barrier Island called Gasparilla. It is a throw back in time with one addition  a zillion golf carts as the primary means of transportation for the many residents of the island community. Years back, the island was owned by a wealthy family. When they turned a good portion of the island over to the town, they stipulated that the entire island had to be zoned solely for single family homes. As a result, there are no high rise condominiums and no traffic lights as have pervaded most of the Florida waterfront elsewhere. White sand beaches that stretch for miles and fishing are primary pastimes here. We decided to forego the marina and instead to anchor in the Boca Bayou, a well protected anchorage north of the channel leading to Miller’s Marina . We dropped our hook in the channel just off the Pink Elephant Restaurant’s dock, then drifted back and slipped between a couple of liveaboard vessels, to tie a line to the mangroves. This was an experience we did not want to pass up. We had the anchors and lines and dinghy all set to go, then as Alex dropped anchor, I back up to the mangrove while he got in the dinghy and secured us to a sturdy branch decorated with shreds of prior tie ups. It was hot in here and lots of little flies descended on us. So we took out our DEET and put up the screens. We then hopped into the dinghy and took a ride around! Oh my, the channel we were in actually backs up to the golf course right on the ocean, and the club house is stunning. The channel leads out to sea and effectively creates an island out of the golf course. The boat houses lining the channel are extraordinary  like elaborate hangars for some of the most beautiful classic vessels you will ever see. It was quite the experience. The town is sweet, with stark white mission-like churches dating back a couple of centuries, shops aplenty, food stores for provisioning, beaches to content the most discerning, and of course golf courses. You gotta have those with all the golf carts in town. There are lots of photo opportunities with stark contrasts in color and light, interesting characters, and pretty views. We had dinner at the exclusive Boca Bay Pass Club. What a spectacular spot and clubhouse. Surrounded by lovely gardens, and overlooking the ocean with expansive windows providing a wide angle lens view, it’s the perfect place to sip a tropical concoction while awaiting the possibility of a fleeting green flash. We didn’t see it that day but we had lots of fun watching. There are plenty of other stops you can make along the way, including a shelling stopover on Sanibel. We kept trying to find shells but the tides were not cooperating. We always arrived long after MLW when the shells were well picked over. We did see a couple with the most beautiful specimens. Huge conch shells in almost perfect shape. All we found were small 3 inch shells with bits broken off, but we kept them anyway. Anyway, when you return, remember to pump out, fill up, and clean out. 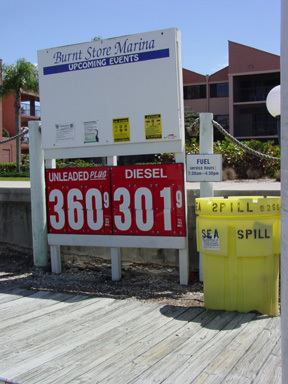 Burnt store marina has some very experienced personnel to take care of you. As you can see, the fuel will cost you some. 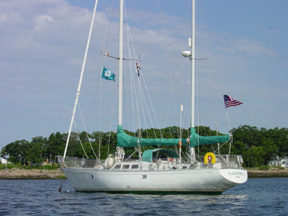 The fuel dock is to starboard as you enter the harbor. Our checkout was uneventful but we did make sure we mentioned all the things that were not right on our boat. That's the only way they'll know what to fix so be sure to tell them what you liked and what you didn't. It was a great week punctuated byt both ordeal and adventure. Not a bad way to recharge your spirit!